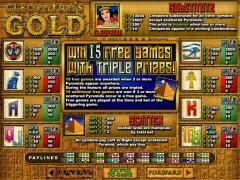 Cleopatra’s Gold belongs to the Real Series video slot from Real Time Gaming. The slot game has five reels, twenty paylines, and a maximum bet of 20 coins. The online slot is based on the theme of wealthy ancient civilizations. In this game the setting is Ancient Egypt and Cleopatra’s personality adds its own charm. The symbols on the reels are rich in Ancient Egyptian mythology. The symbols are led by Cleopatra, the wild symbol, and the Pyramid, the scatter symbols. There are the Scarab and the Cat, which hold a sacred place in Egyptian mythology. The Eye of Horus stands for power and the Ankh or Ansate cross stands for fertility. The high card value symbols are suitably fashioned. The Cleopatra symbol offers the highest fixed jackpot and also doubles payouts when it substitutes in a winning combination. The Pyramid offers scatter payouts and leads to the free spin bonus round. The game has a progressive jackpot that is triggered randomly. Before starting the game players will have to choose the coin denomination by operating the arrows next to the BET button. Coin denominations are 0.01, 0.02, 0.05, 0.10, 0.25, 0.50, 1.00 and 5.00. 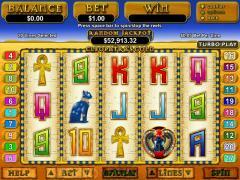 Player will also have to enable up to twenty paylines by operating the arrows next to the LINES button. Winning combinations pay only if they occur in enabled paylines. In Cleopatra’s Gold players are constrained to wager one coin per line by default. Once the settings have been completed the game can be started by clicking the SPIN button. Cleopatra is the wild symbol. It doubles the payouts if it substitutes in a winning combination. It also directly offers line payouts. 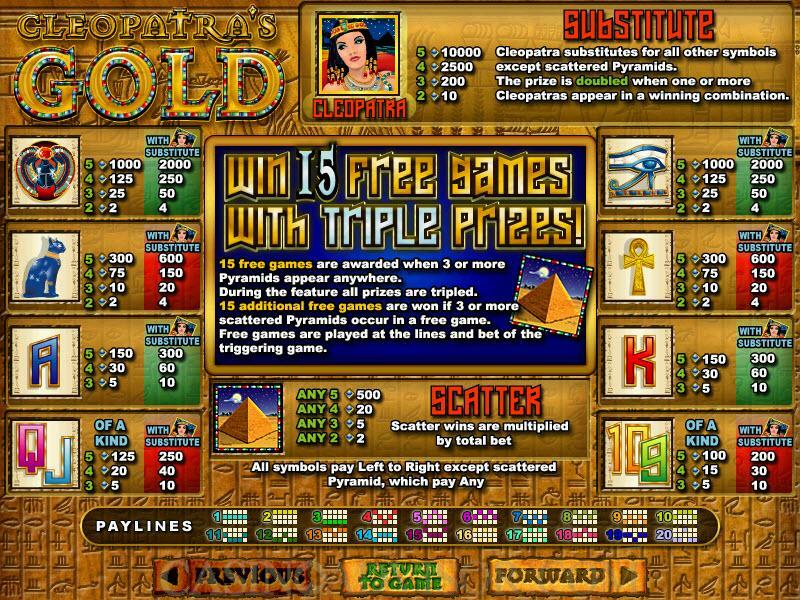 Five Cleopatra symbols in an enabled payline offer 10000 coins. Pyramid is the scatter symbol. Two or more scatter symbols anywhere on the reels result in a scatter payout, which is multiplied by the total bet. Five scatter symbols have a payout of 500 coins. Three or more scatter symbols trigger the free spins bonus round. This feature offers 15 free spins at tripled payouts. The free spins can be re-triggered. Cleopatra’s Gold has a progressive jackpot that is hit randomly. This does not depend on the amount wagered or on the combinations that appear in the enabled paylines. 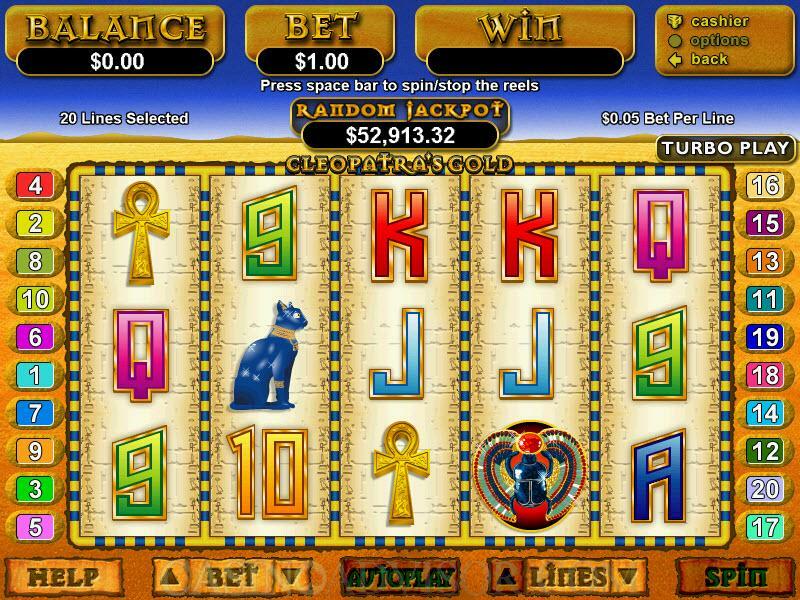 The second highest fixed jackpot is 1000 coins when five Scarab symbols or five Cat symbols appear in an enabled payline. The payout table can be accessed by clicking the HELP button. There are some animation effects when the Cleopatra symbol substitutes in a winning combination and when the Pyramid symbol hits scatter payouts. The animations in the Cleopatra symbol are barely perceptible. In the Pyramid the top starts rotating and a bright light shines from within. The background of the reels is also a simple desert scene. Much more could have been done in these areas. The music is adequate, with the music in the free spins bonus round being particularly catchy. Interested in reading more detailed information about Cleopatra's Gold? If so Click Here for more details.